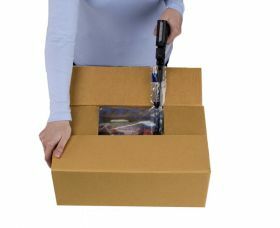 This extra large sealed air bag packaging provides on-demand highly protective but lightweight void fill, ideal for packing big fragile objects safely and economically. 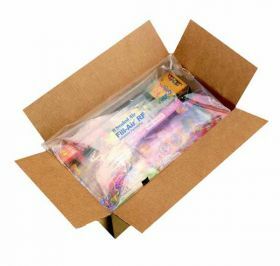 It is supplied as a pack of 100 flatpacked reusable air cushions, 910x1100mm, to be inflated easily with a Rapid Fill Air machine. The air bags produce superior pillow packing which locks products in place in the box. To view our full range of bags click here. There is currently a 5-7 day lead time on this item. Plug in and switch on the Fill-Air packaging machine. 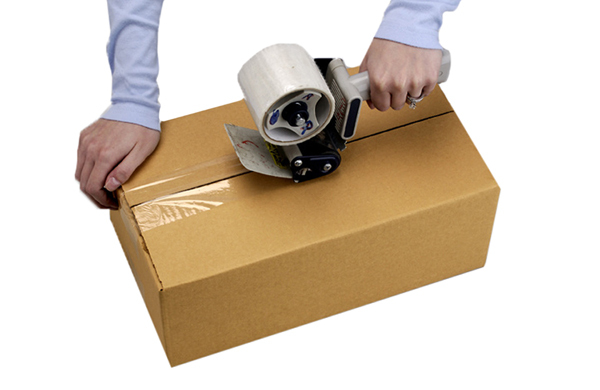 Pack your box with items for dispatch and leave just one area void (to the side or on top). Put the flat sealed air bag in the box and insert the inflator nozzle into its valve. 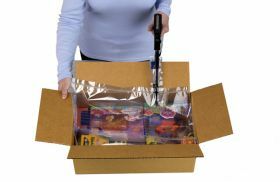 Inflate the bag while holding down 3 of the box flaps, continuing until the void in the box is filled. (The clear air bag makes it easy to check when it has expanded to fill the required space). Remove the inflator nozzle and close the other flap on the box, then seal the box with packing tape as required. Our video demonstration on the right may help you too. Any questions though, just give our sales team a call.